Indoor fountains are an absolute joy to have. They bring peace, tranquility, and serenity to the space they occupy and can easily become a permanent part of the home. But there’s often questions that surround indoor fountains, whether you have one or are thinking about getting one. So here are some of the most common concerns round up to set your mind at ease. 1) How Often Do I Clean It? Believe it or not, an indoor water fountain requires more maintenance than that of an outdoor one. Due to the dust, skin particles, cooking residues, and other nasty things in the air, your indoor model’s pump will be working that much harder. So, it’s good to give a nice, thorough clean a few times each year. You can always monitor it and see for yourself when it should be cleaned. But, aim for at least 3-4 times each year to keep it healthy. 2) Are They Safe to Put Fish in? Sure! You may wan to add an extra filter, depending on how many fish you plan to out in. Do some research and determine just how many fish are recommended for the space your fountain offers. You will be required to clean it more often with living creatures taking up residence. 3) Are They Dangerous for Children? Yes, and no. There shouldn’t be any concern about your children hurting themselves with the fountain, but there’s always the risk of drowning, especially in the larger models. Always monitor your kids and make sure they know about fountain safety and to stay away. They are for looking, not touching. 4) Can I leave it Running All Day? You sure can. You should be constantly recycling your fountain’s water in order to keep it clean and working properly. However, if you plan on leaving for longer than a day it’s definitely recommended to unplug the pump. You should never leave anything electrical running while away for long periods of time to avoid the risk of fire. 5) Can I Put Rocks in It? Go nuts! 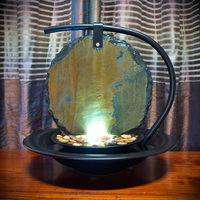 Lots of people accessories their fountains with rocks, glass stones, ornaments, etc. These will never harm your water display. However, make sure they are cleaned and any chemicals are removed before inserting them in the water. 6) How Much Do They Cost? Just like any product on the market, cost always depends on a few things; make/model, size, design, quality, etc. Indoor water fountains come in all sorts of shapes and sizes. You can have a small table top model or a large one with a built-in waterfall. These would obviously range in price quite a bit.